There’s no real way to compare this to the private sector, because the private sector just doesn’t run programs like this. The closest you could come is to compare this level of overhead to average SG&A costs — which is at least something Romney would understand — and on that score the federal government looks great and state governments don’t look too bad either. Most companies would be pretty happy with SG&A expenses of 5-10%. It’s also worth noting that overhead costs go up precisely when the government does the kinds of things conservatives want it to do. 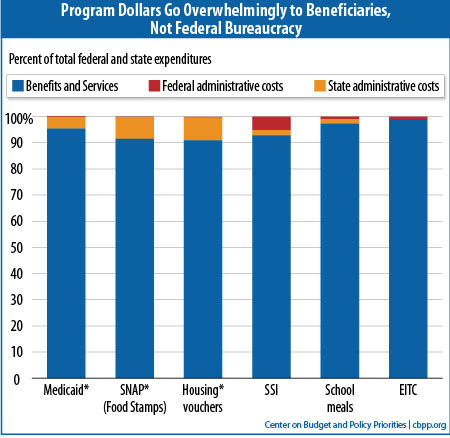 Programs like SNAP and Section 8 housing have fairly stringent means testing rules in order to root out folks trying to game the system, and the result of that is higher admin costs. It’s pretty unavoidable. We could probably cut the overhead costs of housing vouchers by simply giving money to anyone under a certain income line and then calling it a day, but we don’t. We make sure you really truly qualify, we make sure the vouchers are really spent on housing, and we make sure that landlords aren’t scamming either tenants or the taxpayers. This is exactly the kind of thing conservatives are always urging us to do, and it costs money. There’s no way around it. All of these programs could undoubtedly be run more efficiently and I’d love to hear some real suggestions from Romney about how we could do this. But even if his Bain-trained mind does have some good ideas, he’s never going to save more than a few percent. That adds up, and I’m all for it, but it’s not going to make a serious dent in federal spending and he knows it. There’s just no “massive overhead” here and there never has been. The vast bulk of this money goes exactly where it’s supposed to: to the people it’s meant to help.